For our second project in the Make It Last Build Series, we’re constructing a robotic plant. This week, we’re going to build an extendable stem for our plant from a tape measure, and mount it inside of the flower pot. Combined with the plant brain we built last time, we’re well on our way to having a functional robot plant! Just getting started? We suggest you take a look at the announcement post for an introduction to the project and a parts list, then follow along with these instructions to build the brains for the robot plant. If you haven’t signed up for the newsletter, now is a good time to do so. 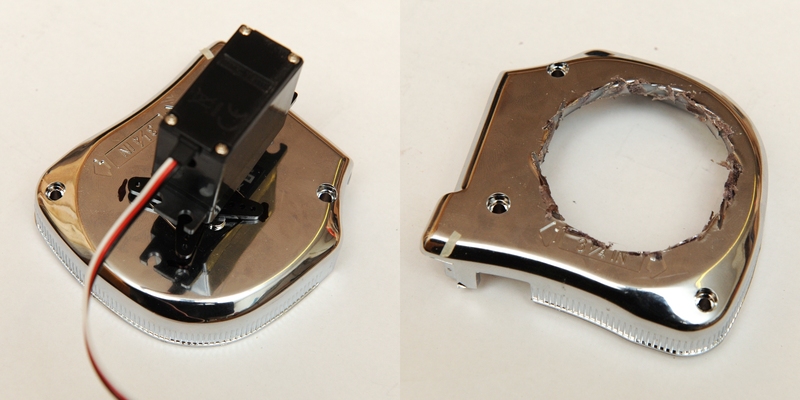 Our tape measure was pretty easy to disassemble — there were only four screws on the back that needed to be removed. 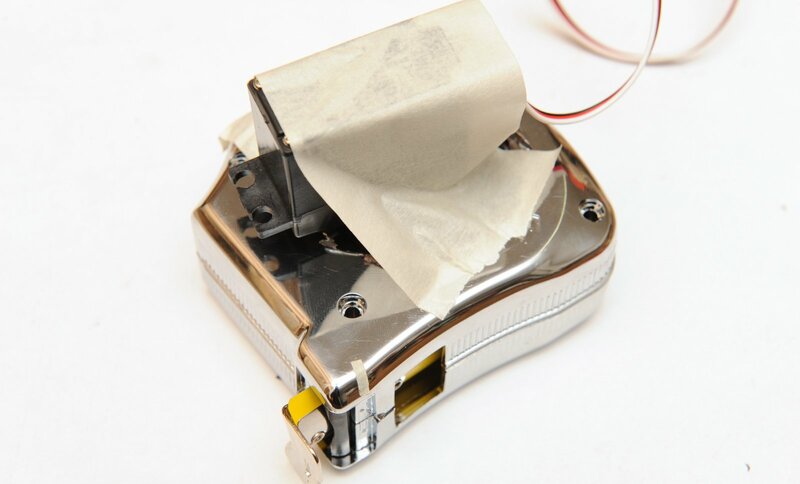 Be careful when removing the top cover of the tape, as the whole assembly is spring loaded and could potentially unwind into a metallic mess. We used masking tape to hold the tape unit together while working on it. After you remove the back of the tape measure, the next step is to cut a hole in it large enough to fit a servo motor. We found that the easiest way to do this was by placing the stepper itself on top to mark the extents of it’s arms, tracing out a circle, then cutting it out using a rotary cutting tool. It’s also a good idea to make the hole a little oversize, to give it some wiggle room. The next step is to mount the servo horn (that’s the x-shaped piece that attaches to the servo) to the tape holder. First, put a piece of masking tape over the end of the tape roll, to prevent it from unwinding. 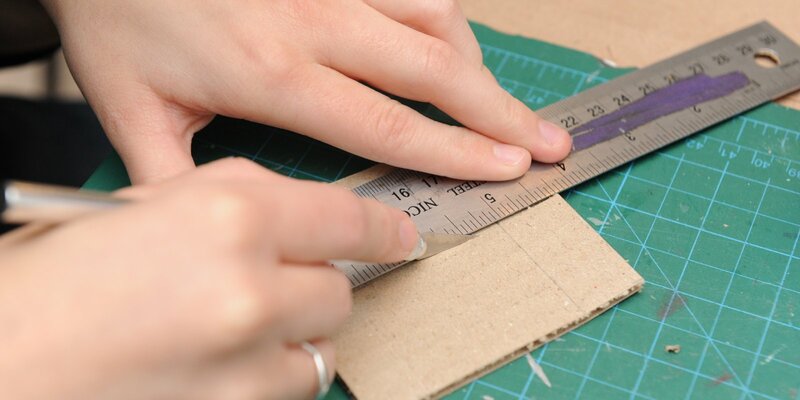 Next, carefully separate the roll from the back of the tape measure shell. 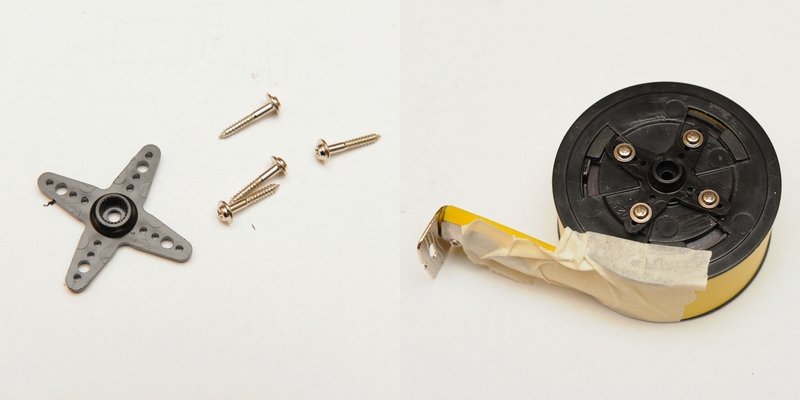 There is a return spring (the thing that makes the tape retract back into the tape measure) hidden in the center of the roll, and you may need to detach it from the back of the tape measure shell by cutting it. Once the roll is disconnected, you can use some small screws to attach the horn to it. Try and center it as best as possible, so that it will rotate smoothly. The screws that we used were a bit too large for the servo horn holes, so we used a drill to open the holes up a little bit. Now, attach the servo motor to the tape roll. The only trick here is that the top of the tape measure case has to be between the servo motor and the tape roll, and unless you made the hole in it oversized, you will need to place it between them before re-attaching the servo horn to the servo. Once the tape roll is attached, re-assemble the tape measure. We discarded the locking mechanisms from our tape measure so that they wouldn’t interfere with the servo’s operation. It’s a good idea at this point to hook the servo up to the plant brains, to make sure that the assembly works well. It’s a good idea at this point to hook the servo up to the plant brains, to make sure that the assembly works well. Plug in the servo (making sure to put it in the right way- the white control line should be connected to the pin closest to the microcontroller), then turn the robot brains on. Touch the sensor wire to activate the servo, which should cause the tape measure to extend and then retract. If everything worked, you can unplug and disconnect the brains now. This step will vary based on the flower pot and tape measure that you are using. 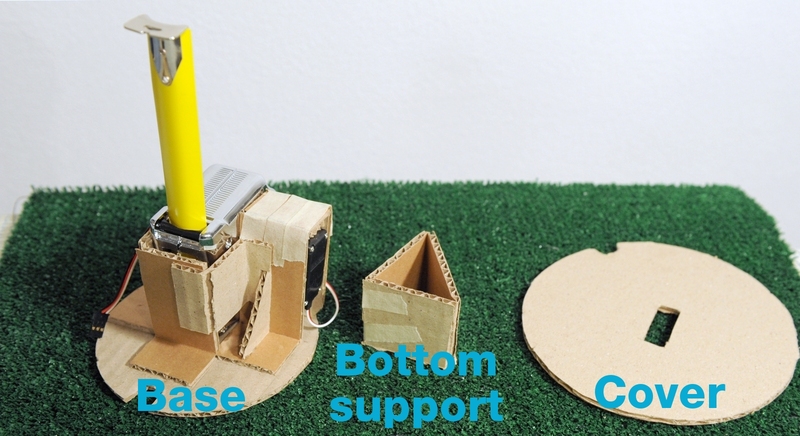 The basic idea is to sandwich the tape measure/servo motor assembly between two cardboard discs, and hold them in place using vertical supports made of cardboard. We also built a triangular support piece that goes between the bottom of the flower pot and the tape measure base. After some fiddling and adjusting, everything should fit neatly into your flower pot. The final step is to hook it up to the plant brains, and give it a try! Turn the brains on, and touch the sensor wire. If all went well, the tape measure should grow out of the the plant base, then retract back in. Next week, we’ll add a blooming flower to the end of our plant, and start to work on making it’s plant-like behavior.